In natural soil environments, a symbiotic relationship exists between microbes and plant life. Plants like grass, trees and food crops depend on microorganisms in the soil to obtain water, ward off dangerous organisms, prevent nutrient loss and break down compounds that could inhibit growth. These soil microbes, in return, benefit from the health of plants growing in the soil. This relationship creates a dynamic living system that is easily broken by human systems that use pesticides, herbicides and fertilizers. 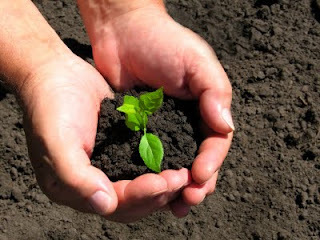 The chemicals humans use to enhance plant growth can actually destroy the soil system, killing or causing mutation pressure on the soil microbes that all other organisms in the ecosystem need to survive. A small handful of healthy soil will include millions of microscopic organisms that are beneficial to the soil systems where healthy plants grow, including fungi, nematodes, protozoa, microathopods and other beneficial bacteria. These microbes decompose organic material while they absorb water and nutrients that would otherwise get lost in the soil; the absorbed water and nutrients then get used by more and more complex creatures. This ecosystem ranges from the tiniest bacteria to the largest mammal predators. Any damage suffered by one part of the system can affect the health of all the others. The first level of the soil ecosystem is made up of bacteria and fungi that consume leftover organic matter, nitrogen and nutrients. These organisms act like a nutrient bank that plants can use when they need it. The second level of organisms consists of predators that feed on the bacteria and fungi. Nitrogen and nutrients are metabolized and released into the soil at a slow rate that is beneficial to plant growth. Higher-level predators, like millipedes and earthworms, make up the third level. These animals keep the second-level organisms in check, helping the plants maintain a healthy growth rate. The third level is also made up of bigger predators that keep the smaller ones from over eating. This extensive bio-diversity is what makes all life in the soil ecosystem possible. Pesticides include a large group of chemical agents that attempt to eliminate destructive biological forces in agriculture. These include herbicides for killing plants, insecticides for killing insects, fungicides for killing fungus and bactericides for killing bacteria. While these chemicals supposedly only target specific species, repeated use inevitably kills microbial life that is beneficial to the soil system. Microbes that survive can be genetically altered in a way that is no longer beneficial to the soil ecosystem and be resistant to the chemical intended to kill them. The destruction or alteration of first-level microbes can affect the entire soil ecosystem all the way up to the largest mammalian predators. Microbial communities work in concert (or synergy) to out-compete antagonistic communities of microbes. This is a balance between "good" and "bad" microbes. Many microbial species (the good ones) kill or inhibit bacteria, fungi and nematodes (the bad ones) that attack the root systems important for the exchange of valuable nutrients in the soil through competitive exclusion. Good microorganisms improve the soil structure by producing glues, hyphae strands and tunnels for air and water. Good microbes also eat a lot of toxic material that would otherwise make for poisonous soil, but they do need healthy organic soil to consume with it. An imbalance of soil microbes can result in parasitic infestations, root disease, breakdown of the soil structure and build-up of toxic compounds. When the soils are repeatedly treated with toxic chemicals, the balance between good and bad is disrupted and the soils can actually become toxic to plants. Microbe numbers in the soil can be maintained by making sure the soil has plenty of digestible plant material (organic matter) with high levels of nitrogen to feed microbes. A blend of proteins from vegetable and animal sources can provide the material to help make this possible. Likewise, regularly folding in a healthy dose of an all-natural microbial inoculant soil amendment which will enhance the soil with beneficial microbes for crops and horticulture will retain or restore microbial balance. High-quality organic composts, grass clippings and lawn litter can also benefit soil microbes. And, of course, harsh pesticides should never be used due to their destructive impact on microbial lifeforms. It is unfortunate that our current culture has been marketed and advertised into believing the myth of better living through chemicals. Only in the last few years has research begun to catch up with the effects of the destructive nature of synthetic agricultural products. Dr. Higa explains it best when he talks about the synergy that exists in the soil, the plant and mankind. When man tampers with the natural order instead of working with it, he invites disaster. The belief that we can grow healthy produce while killing of the very micro organisms required to support growth, is not only futile but insane as well. In an attempt to make unhealthy plants grow under the burden of all this toxicity, seeds are now genetically modified in a lab without any thought long term testing or responsibility for destroying that natural order. We are told to use chemical hand sanitizers because we have become so worried about bad micro organisms we feel a compulsion to kill everything. Perhaps when the public at large finally understands that our bodies desperately need vast populations of beneficial micro organisms (ProBiotics) to be healthy, we will finally understand why our soil and produce need these as well.